Saying goodbye to a loved one is not an easy thing to do. 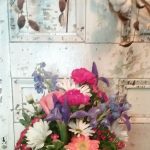 Sending flowers is an extremely fitting way to pay tribute to one you have lost. Give us the opportunity to design arrangements that will express your thoughts through beautiful blooms. We encourage you to share your ideas with us so that your bouquet will express a personal touch from your heart. Perhaps you want to incorporate your own memorial objects into an arrangement. 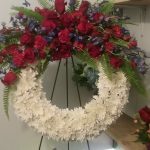 We will gladly help and guide you regarding your memorial tribute designs.